Perhaps, as Mark Twain observed, it is better not to know so much than to know so many things that aren’t so. Mark Twain once said that “the trouble with old men is they remember so many things that ain’t so,” but this book of war reminiscences is different from most of Twain’s reminiscences. Members of the committee were reminded of Mark Twain’s dictum, that the trouble with reminiscences is not that people know too much, but that they know so many things that aren’t so. Mark Twain used to say that “the trouble with old men’s memories is that they remember so many things that ain’t so.” Since I heard him say that several times I have been careful not to state anything unusual lest my friends should think that Mark Twain’s arraignment is true in my case. It ain’t so much people’s ignorance that does the harm as their knowing so darned much that ain’t so.—JOSH BILLINGS. It ain’t what a man don’t know-that makes him a fool; it’s the awful sight of things he knows’ that ain’t so. Josh Billings said something of that sort, and Josh Billings knew what he was talking about. It ain’t so much the things that people don’t know that makes trouble in this world, as it is the things that people know that ain’t so. — Mark Twain. Abe Martin’s definition of ignorance was “not so much what a person don’t know, as what he knows that ain’t so.” And he is certainly correct. Well, the trouble with our liberal friends is not that they are ignorant, but that they know so much that isn’t so! ‘Tain’t what a man don’t know that hurts him; it’s what he knows that just ain’t so. The trouble with most people, as Will Rogers observed, is not that they don’t know much but that they know so much that isn’t true. “I keep quoting Will Rogers as saying of (former President Herbert) Hoover that it’s not what he doesn’t know that bothers me, it’s what he knows for sure that just ain’t so,” Mondale said. In conclusion, the target saying evolved incrementally over time. Instances have been attributed to a variety of humorists such as Mark Twain, Josh Billings, Artemus Ward, Kin Hubbard, and Will Rogers. However, there is no substantive evidence that the saying was crafted but one of these funny men. The ascription remains anonymous. The 1874 quotation from Josh Billings: “I honestly beleave it iz better tew know nothing than two know what ain’t so” is further explored on this webpage. 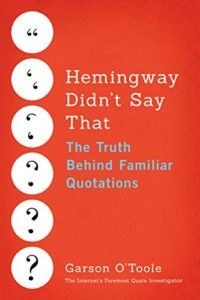 The quotation from Mark Twain: “When I was younger I could remember anything, whether it happened or not; but I am getting old, and soon I shall remember only the latter” is further explored on this webpage. Image Notes: Public domain picture of Josh Billings (Henry Wheeler Shaw) from the Harvard Theatre Collection. Public domain picture of Mark Twain (Samuel Clemens) by Abdullah Frères circa 1867 from the Library of Congress. Public domain picture of Artemus Ward (Charles Farrar Brown) from the Harvard Theatre Collection. Images accessed via Wikimedia Commons. Images have been resized, retouched, and cropped. Update History: On November 23, 2018 the November 1964 and the June 1983 citations were added.